Introducing incredible range of AGRAS billet parts for the 3rd generation 10 ZX-10R. The Japanese aftermarket parts industry has a long history, often going hand in hand with new Japanese bike releases, providing new and innovative enhancements to the makers bikes. Agras is such a company. One of the originators of billeted alloy parts, originally specializing on Suzuki machines, and now catering for many makers and types of bikes. Over the years Agras products have developed into innovative, beautifully crafted and billeted masterpieces, adding a new dimension and quality to your treasured machine. Introducing Agras' complete lineup of high quality billet parts for All New 2010 Z1000. Perfectly crafted parts for adding final touch on your Kawasaki's latest Streetfighter. Introducing complete lineup of AGRAS billet parts for 2009YZF-R1. billeted add-ons for the latest R1! AGRAS billet parts and sliders for 09 GSX-R1000. Perfect your GIXXER with Moto-works.jp and Agras Japan! 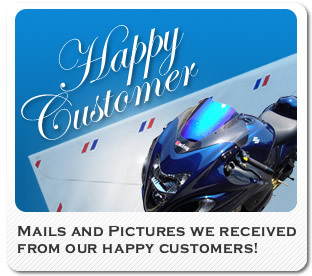 Introducing complete lineup of AGRAS billet parts for 07-08 GSX-R1000. Rear Sets and other high end components for the majestic Suzuki. Perfect add-ons for your GIXXER! AGRAS YAMAHA FZ1 Billet parts Agras Japan is proud to introduce a fine range of slider, rearsets and other aftermarket add-ons for the glorious machine! AGRAS billeted add-ons for the Kawasaki hypersports ZX-14 Perfect your treasure with Moto-works.jp and Agras! Introducing complete lineup of AGRAS billet parts for 06-07 ZX-10R.Enjoy the range of quality add-ons for your Kawasaki superbike! Protect your ’07-’08 YZF-R1 with high quality billet sliders and Bring out total sift control with precisely machined rear sets. Introducing Agras' complete lineup of high quality billet parts for 04- 06 YZF-R1. Perfectly crafted parts for adding final touch to your canyon king. Agras is very proud to carry a large range of beautifully produced parts for this timeless hyperbike,and with Agras'strong connection to Suzuki in Japan they compliment the Hayabusa perfectly! Moto-works.jp is proud to introduce Agras to our range of products, and we will be expanding the line up very shortly, starting off with parts for the incredible Suzuki B-KING. Perfect your bike with Moto-works.jp and Agras Japan!